On Tuesday Ashlee from TopsyTurvy taught us how to make a Topsy Turvy cake. 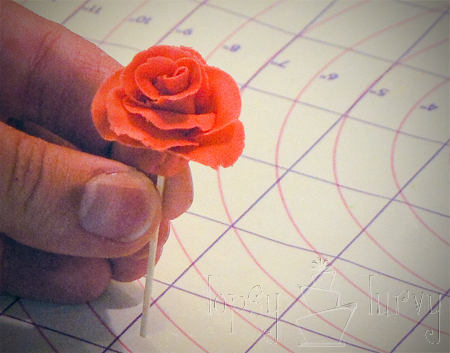 Now she's back to show us how to make these gorgeous, realistic roses for decorating it. Take it away Ashlee! 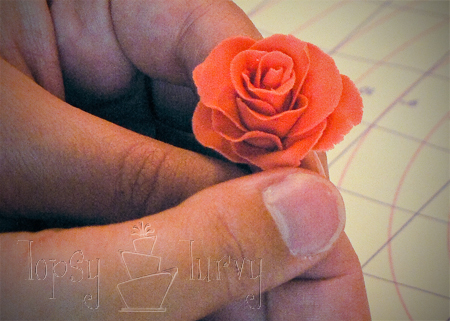 I'm Ashlee from Topsy Turvy again, this time to show you how to make Fondant Roses like on this cake here! This is easier to show in person, or maybe I'll do a video soon, but for now this will be a long post, don't let it intimidate you. Once you get the hang of them it get's easier. 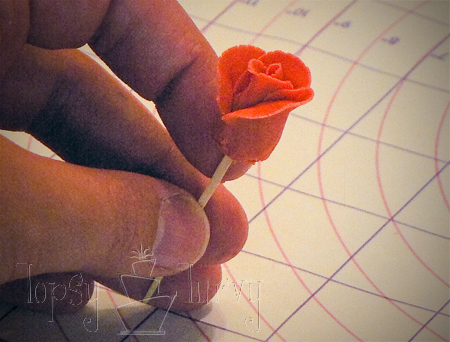 When I'm making a ton of roses I like to watch a movie at night with my husband while I work on each stage. 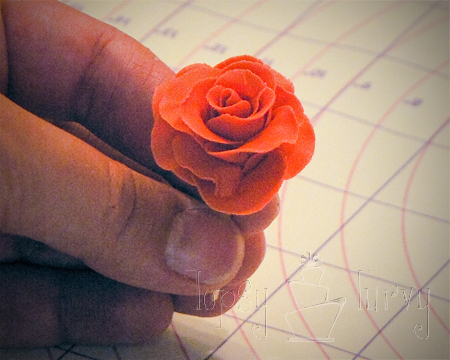 Fondant is sufficient for making a rose, Gum-paste is great (you can get it REALLY thin), but a fondant Gum-paste mix is my preference. 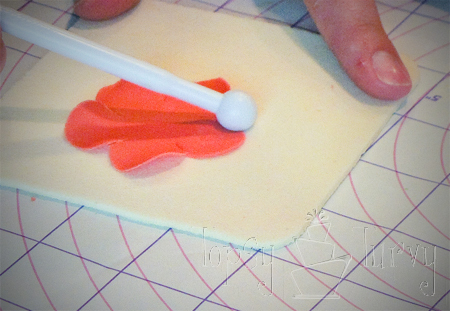 Fondant alone is too thin, Gum-paste is sometimes more difficult to use. So a mix between the too is great. You can make them in one day, but it's easier to work with them if you do each stage at different times. 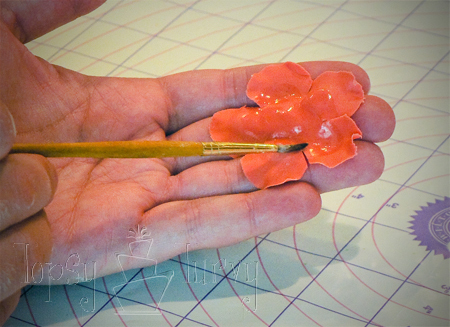 The secret to making them look as realistic as you can is to get the petal layers as THIN as possible. 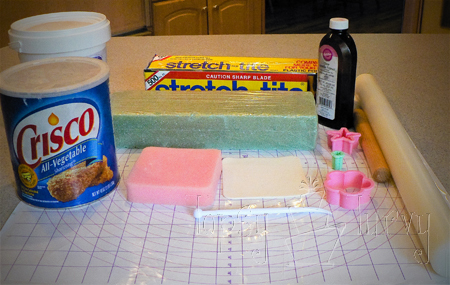 First you want to mix the gum-paste and fondant at a 1 to 1 or 2 to 1 ratio. It totally is up to you what you like working with best. 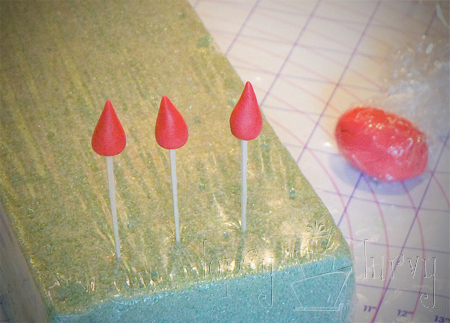 If you don't want to buy a package of gumpaste you can also use Gum Tex. It's a powder and will last longer, although it's not quite as good as using gum-paste. 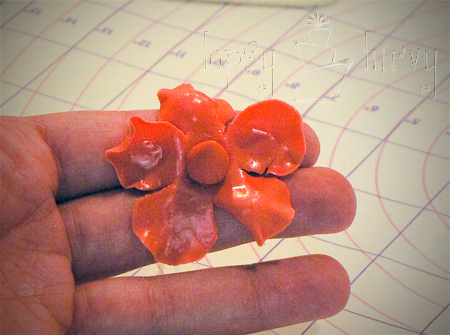 But since Gum-paste dries out pretty fast you'll only want to go that way if you'll be using it before it gets dry. Don't forget to also mix in whatever color you want your roses to be. 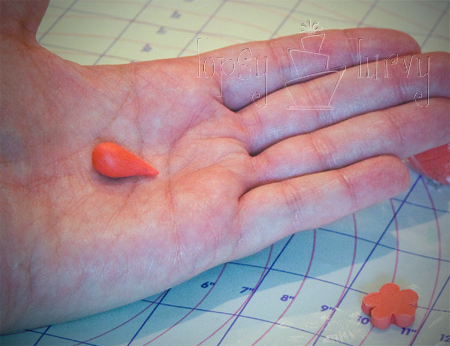 When working with Fondant and gum-paste you don't want it to stick to your hand, so you have two choices. Use lots of Crisco or dust everything with a cornstarch/powdered sugar mixture. 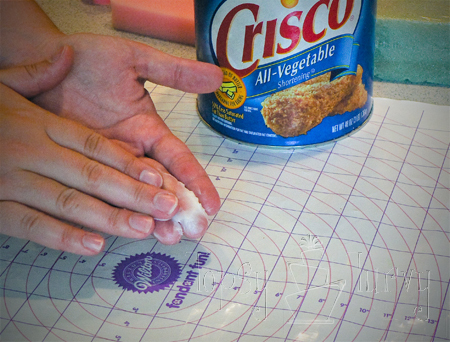 I like using Crisco on my hands, mat and rolling pin, and the cornstarch/powdered sugar mixture on tools. 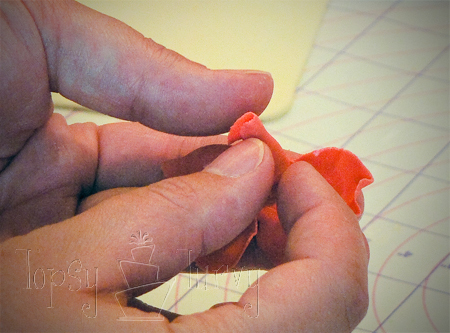 Roll the fondant from center to the edge to stretch into a very thin layer. I know it is thin enough when I cannot roll it any thinner and I can read the mat printed font through it. 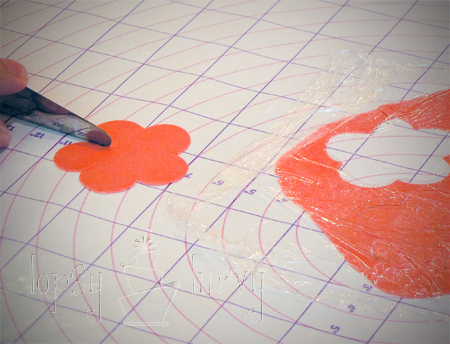 Then use your medium sized flower cutter and cut as many flowers as you can. Don't work with too much of the fondant at one time. 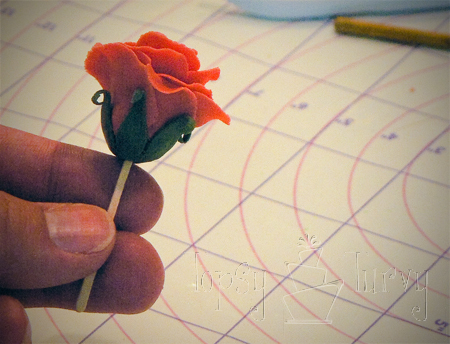 In order to create a more realistic effect, we have to thin the edges of each petal with the ball tool. 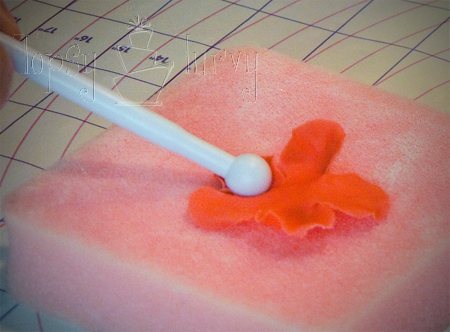 Place the petal layer on the thin foam mat (Note that I covered the foam with the cornstarch/powdered sugar mixture to prevent sticking.) 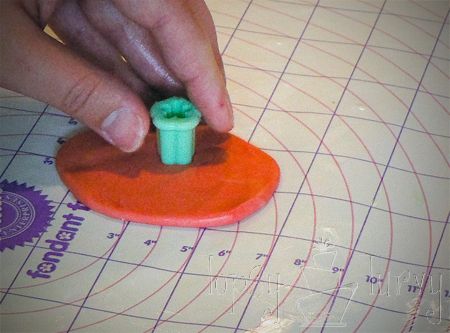 Place the one side of the ball tool at its middle (i.e., half of the ball is touching the fondant and the second half the thin mat). 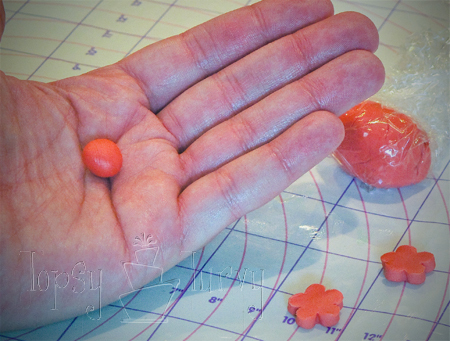 Roll your ball at the edge on each petal by pressing a softly. 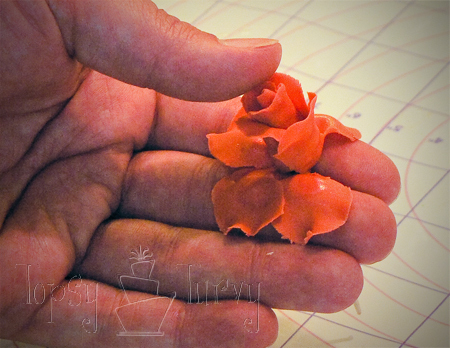 You will see the petals "rippling". You don't want to over ruffle, so just softly and you can go over it. 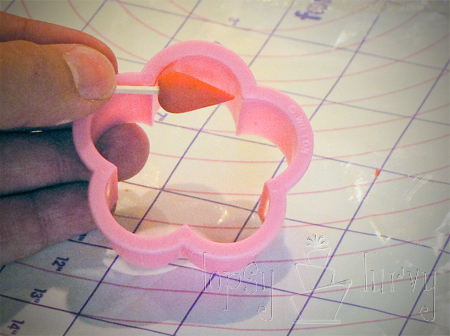 This is where the gumpaste part comes in handy. If it's just the fondant it tends to rip. 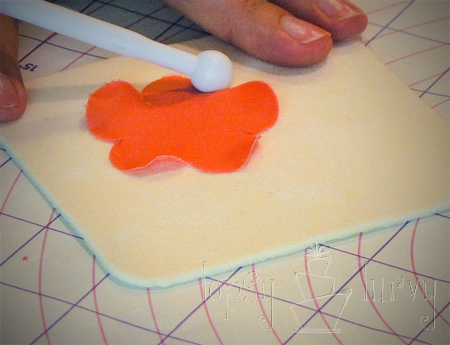 Place your thinned petal layer on top of the thick foam pad. Note that I covered the foam with the cornstarch/powdered sugar mixture to prevent sticking. 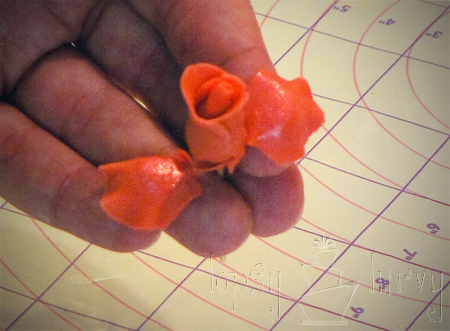 With the ball, we're going to shape the first layer petals. Think of the 5 petals like a man, "head" (top), "arms" (sides) and "legs" (bottom 2). Press the circle into the "head", "legs" and center. Flip it over and press the circle into the "arms". 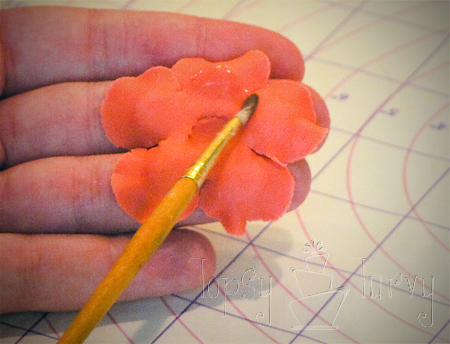 Apply vanilla to the inside half's of each petal, the center and one full "foot" petal. 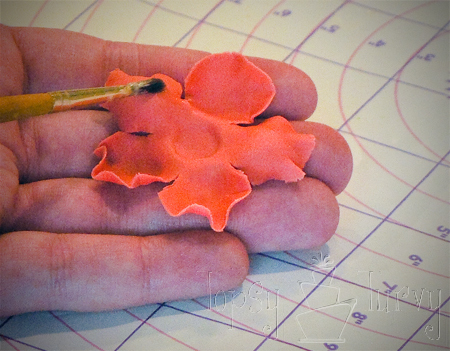 Now take the "foot" petal that has the full vanilla on it and wrap it around the tear drop center. 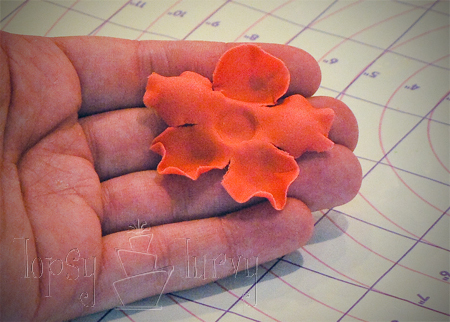 (I flipped the petal layer around so my "foot" is on top). Now wrap around and "glue" the "arms" up. At this point I like to go through and do ALL the first layer on all the centers, so they can dry a bit and can be handled easier before moving onto the next layer. But of course you CAN just go straight on, just be careful because it's still soft. Repeat steps 1-4 from the first layer. Then move it over to the thick foam and press the circle into the "arms" and center, then flip over to press into the "head" and "legs". So just opposite from the last layer and add the vanilla! Now bring up and "glue" the "legs" and the "head". 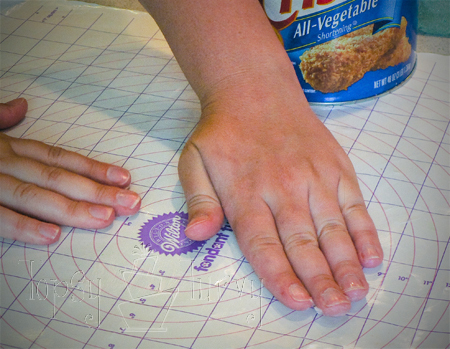 And remember to go back and curl the edges back just a bit. And you done with the second layer! Finish them all and let them dry OR... move on to the third layer! 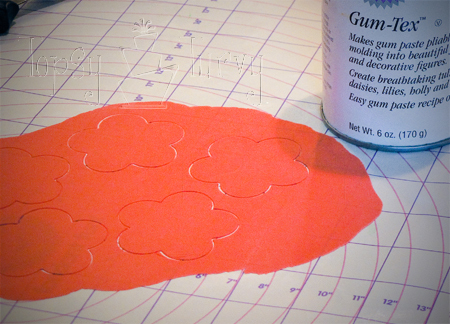 Now like drawing a star you'll bring up each of the 5 petal's one at a time "gluing" them on. 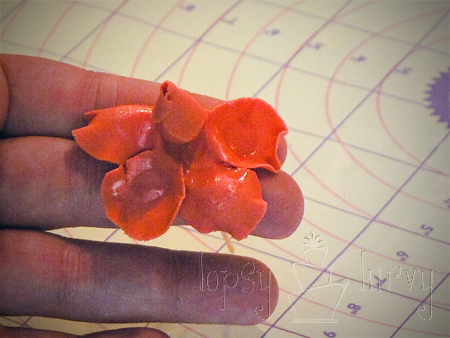 Like this: "leg", "head", "leg", "arm" and "arm"... Once you have them glued on remember to curl back the edges of the petals to create a more realistic look! 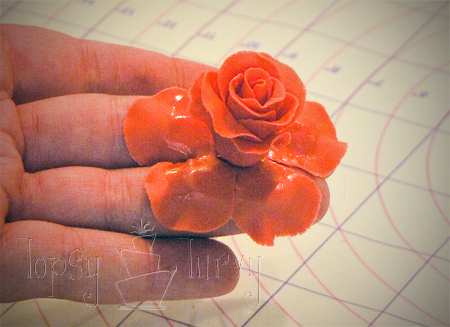 You can also add a Calyx if you want, but since my roses are usually in a cake I don't bother! It just depends on how much of the back of the rose you'll be seeing. If I stop at layer 1 or 2 for some buds I might add one. 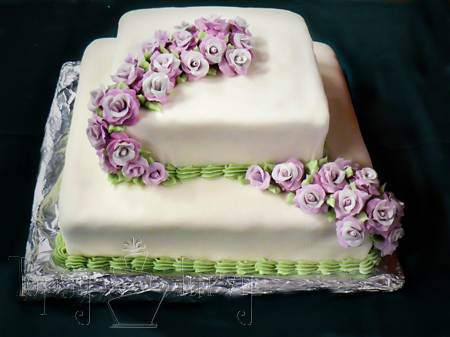 Thanks again to Ashlee for sharing some gorgeous cake decorating secrets! Those roses are so beautiful! I wish I was that talented! Thanks for the tutorial! I just finished looking at your beautiful tutorial. Oh my goodness. How beautiful. 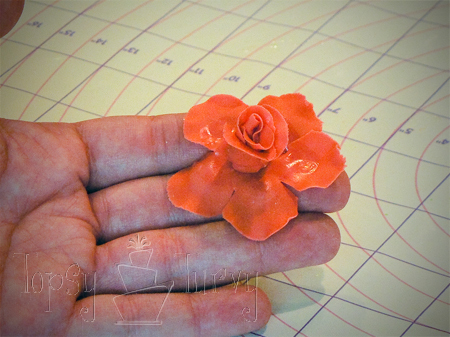 I took cake decorating classes a couple time but never saw such a simple way to make a fondant flower. I always thought it was intimidating. Now I think I can actually make one. Who knew that it could be so simple. Thanks for giving me confidence. I am going to make some of these. Maybe even teach my kids. Oh how fun! Have a great weekend. Also visiting from NFF. Thanks for linking up. I'm your latest NFF follower, pls. return the favor! I'm taking a Wilton class and just learned to make these last week. I love them and think they are so much prettier than the buttercream ones! That looks easier than any other method I've seen. I just got to try that. Wow, those are really gorgeous! 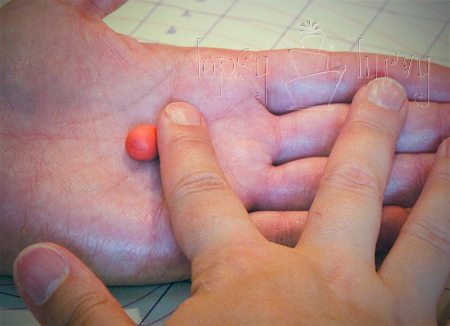 Thanks so much for sharing the how-to, I'll be linking.